82101 1:18 scale Mini Garage Diorama. 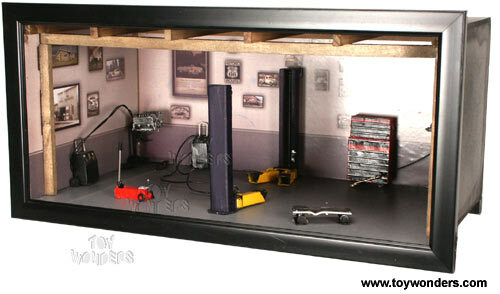 This hand crafted mini garage diorama measures 17.75"Lx 9"Wx 8.5"H. This diorama includes car lift, hand car jack, tool box, large air compressor (not in pictured), engine block on a stand, battery charger and cables, welding tanks, and is decorated by different posters. Looks like a real garage. Just place your favorite 1:18 scale diecast vehicle inside and it will have a great home. 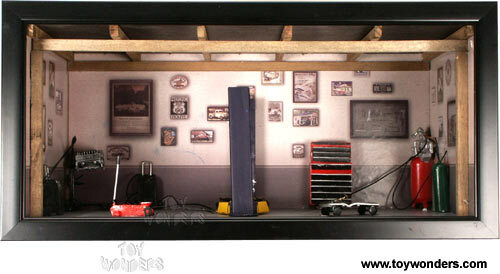 The ebony colored frame makes these an ideal garage diorama scene to hang on walls or place on a shelf/mantle. Perfect for exhibiting your favorite car. This mini garage diorama is too FRAGILE to ship by common carrier. PICKUP ORDERS ONLY! Click on the zoom button on the bottom right corner to see another detailed picture. To see other garages (click here). Price quoted is for 1 case.